The Congress today demanded that Prime Minister Narendra Modi make a statement in Parliament on the Chinese presence in Dokalam and also take the nation into confidence on his government's policy on demilitarisation in the trijunction. Congress chief spokesperson Randeep Surjewala accused the government of "managing headlines" and claimed that External Affairs Minister Sushma Swaraj's statement on Dokalam in Parliament "hides more than it reveals". "In national interest, the Congress demands that Prime Minister Narendra Modi make a statement and take the nation into confidence by placing the entire spectrum of facts on the floor of Parliament. The PM must tell his government's policy on demilitarising the Doklam plateau," he said. In a statement, he alleged that the government's "denials, half-truths and doublespeak" on Doklam were endangering India's national security and strategic interests. Surjewala said Swaraj's statement on Doklam was covered with "misleading opaqueness" and failed to provide the larger picture of Chinese presence in South Doklam. He alleged that as China stares at the Siliguri Corridor, the Gateway to India's North East, the BJP government nearly ducks the Doklam question. "The Modi government hid behind a sheet of misleading opaqueness on Doklam today. The external affairs minister claimed in Parliament that the 73 day standoff in Doklam has been resolved with diplomatic maturity without losing any ground and there is no change in the status quo (on the ground). The face off at sight has been resolved on August 28, 2017," he said. He alleged that the government and Swaraj were "conspicuously silent" on the Chinese military buildup and new road construction in the South Doklam region, overlooking the Chicken's Neck. "Swaraj said nothing about the creation of a full-fledged Chinese military complex at Doklam right upto 10 metres from Indian Army Post, reflected in the satellite imagery released earlier by the Congress, besides media reports," he said. 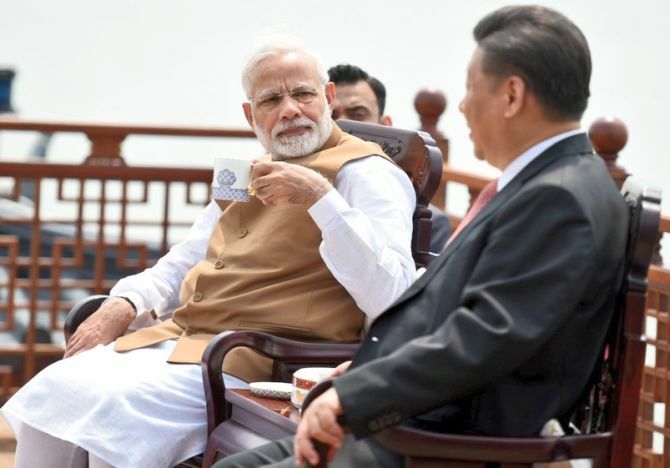 Surjewala said the prime minister had met his Chinese counterpart Xi Jinping on July 26 on the sidelines of the BRICS Summit in South Africa, the third bilateral meeting of Modi with his Chinese counterpart in the past four months. "Disappointingly, the Modi government could not give a conclusive reaction to the numerous media reports and developments regarding the Doklam stand-off that have compromised India's national security and endangered its strategic interests," he said.